Attorney Fawn Singletary graduated from the University of Florida’s Levin College of Law with her Juris Doctorate degree in 1988 and has been giving back by helping the members of Marion and surrounding counties ever since. With over 25 years of experience in the areas of Business, Finance, Bankruptcy and Entertainment, Fawn Singletary knows how to pay attention to the details and take care of her clients. Ms. Singletary currently lives in Ocala with her husband Gary, her son Colton, her Yellow Lab Molly, and her cat Bucky. 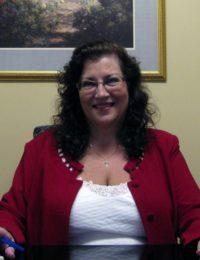 She also currently serves as chair of the Trinity Catholic High School building committee and has previously been on the Executive Council for the “Inn of Court” organization, served as Vice Chair of the Trinity Catholic Board of Trustees, and has served as Chair of the Blessed Trinity School Board. When she can work in a quick vacation she enjoys going to the beach and spending her day reading a good book. 31 years since Fawn Singletary was first licensed to practice law.